“Knocking on Heaven’s Door” by Katie Butler is a book that will resonate with most of our GeriPal readership. In it she writes about a medical system that is all too enamored with expensive high-tech interventions while high-touch, low-cost interventions are rarely reimbursed yet desperately sought after by family caregivers. It is a theme that we have written about before on this blog, but her story sheds a light on the dysfunction of our health care system when it comes to someone dealing with a chronic, progressive illness like dementia. Butler leads us through the story of caring for her father Jeffrey, a World War II veteran, professor, and father of three who suffered a stroke in his late 70s. With the honesty that I can only imagine comes from Butler’s time as a reporter, she opens up a world where caregiving duties fall on the shoulders of wives and daughters, of which the medical system and others rely heavily on but provide far too little support. This past week we have written about putting pacemakers in and turing them off. 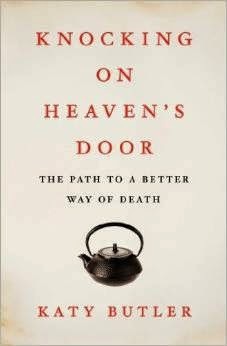 If any of what we talked about interested you then “Knocking on Heaven’s Door” is a must read. The mix of reporting, personal journal, and instruction manual also makes it an important read for caregivers of older adults with chronic illness. Lastly, this is a perfect gift for those physicians who refuse to deactivate devices like pacemakers because they feel like it is somehow more special than any other life sustaining treatments. Thank you so much, Eric, for helping Katy Butler to bring this important topic out into the light. I haven't read the book yet, so my comments fall into the category of bullcrit ie commentary re: a book not yet read. Reflecting on the quote about 'putting a pillow' I am reminded of how powerful and how dangerous our words can be during clinical encounters especially during such fraught times. We teach our trainees how to account for declines in creatinine clearance when dosing drugs, perhaps we should also teach them (and ourselves) to be judicious in dosing out our words during times when there may be limited emotional reserve.